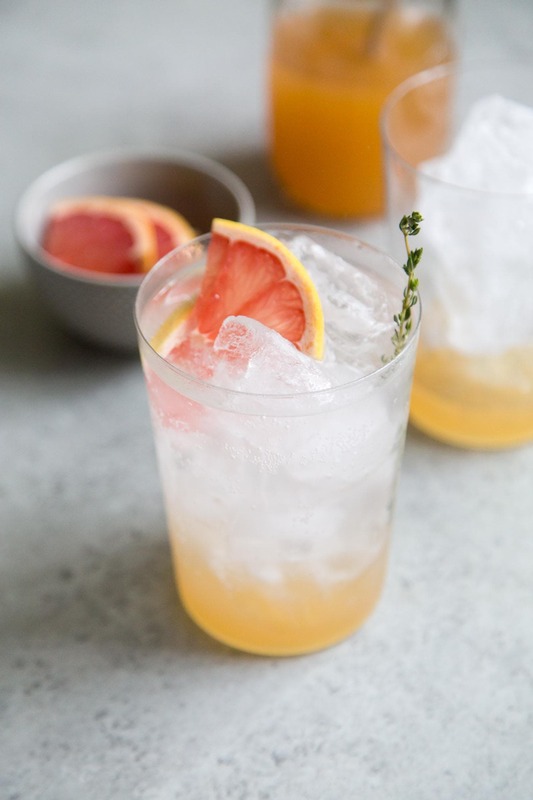 This sparkling grapefruit shrub mocktail combines fresh grapefruit, apple cider vinegar, and sparkling water for a refreshing anytime beverage. Shrubs are generally made with equal parts fruit, sugar, and vinegar. The possible flavor combinations are infinite. Along with a variety of fresh fruits, you can also add herbs and spices (think rosemary, cinnamon, star anise, etc). There are plenty of options for vinegar as well. I prefer apple cider vinegar, but other choices include balsamic vinegar, wine vinegar, or the standard distilled white vinegar. 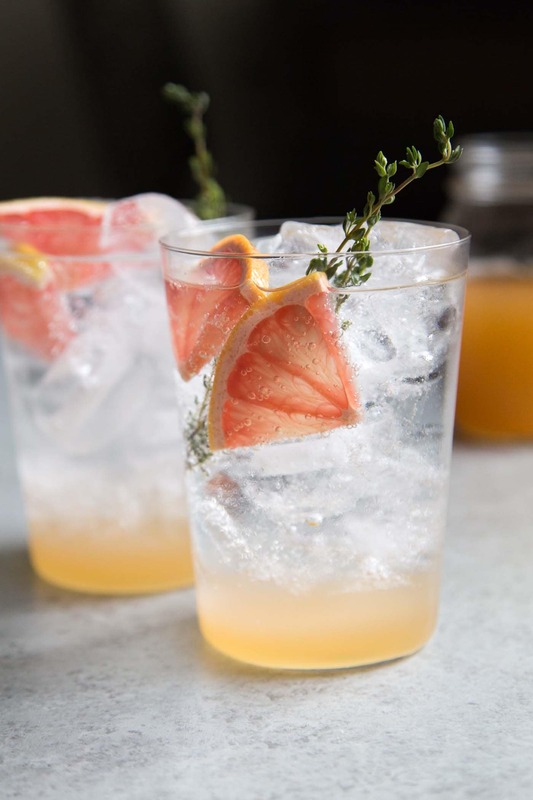 This grapefruit shrub is made with fresh grapefruit segments, grapefruit peel, granulated sugar, and apple cider vinegar. 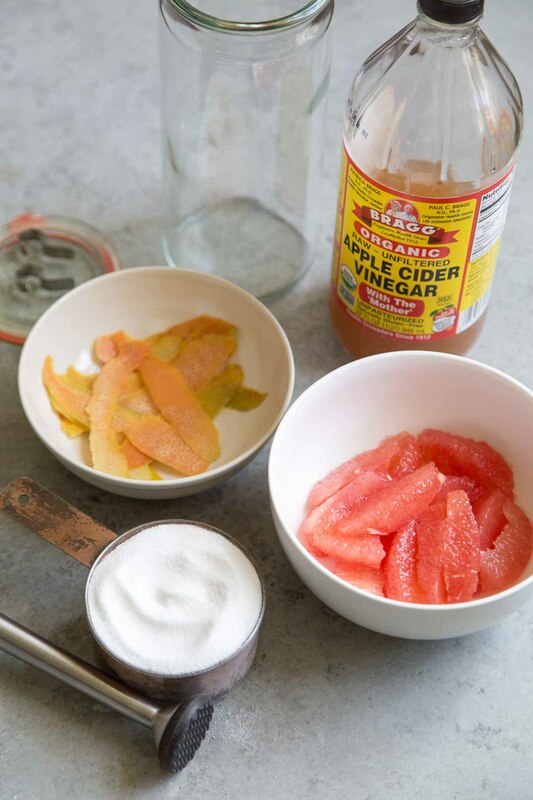 I like to include the citrus peel because it contains a lot of flavor and it helps to mellow out the vinegar and tart grapefruit. Start by using a muddler to crush the peel with the sugar. The oils from the grapefruit peel will soak into the sugars. Follow up with fresh grapefruit segments. Muddle the fruit to extract it’s juices. Finally, stir in the vinegar and let the mixture steep for 2-4 days in the fridge. Strain out the solids and keep the liquid in the fridge until you’re ready for a refreshing beverage. (NOTE: You can eat the strained out fruit solids. They’re delicious!) 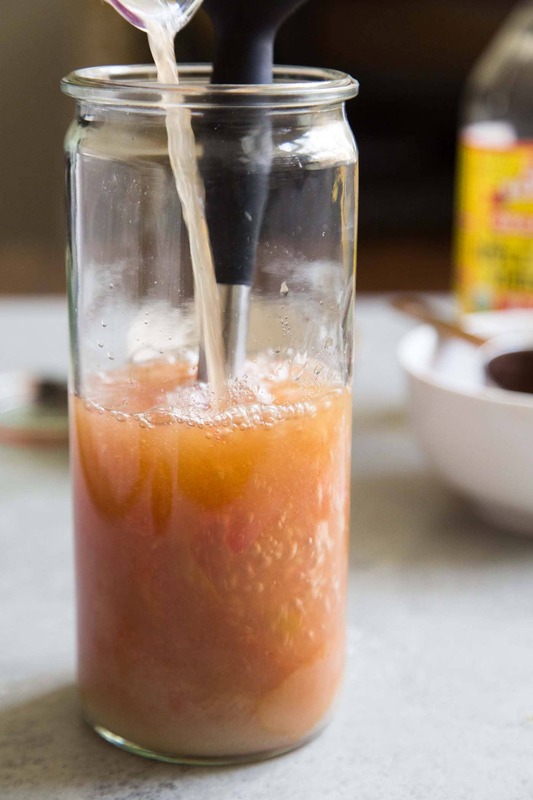 The fruit shrub should keep in the fridge for up to month, although you’ll likely finish it before then. The grapefruit shrub syrup on it’s own is a tasty combination of sweet and sour. You can mix it in tea, juices, or sparkling water. Mix with chilled sparkling water, it’s the BEST mocktail ever. It tastes similar to kombucha. Vinegar has been touted as a “health tonic” for ages, especially in Asia. It’s supposed to help digestion, clear skin, and aid in weight loss. 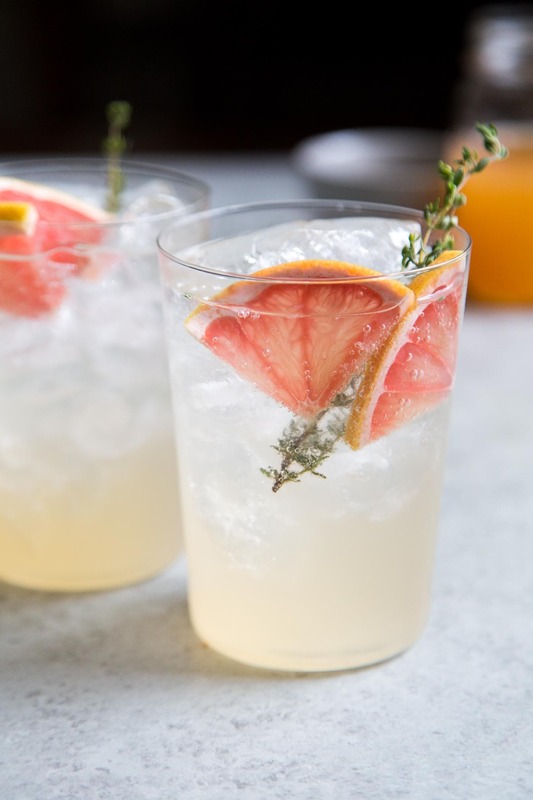 This grapefruit shrub isn’t any miracle cure, and it’s not likely going to cure a stomachache. But, it sure is tasty! It’s a delicious non-alcoholic mocktail that everyone can enjoy. Cheers! Place sugar in a large pitcher or mason jar. Add grapefruit peel and muddle together to release oils from peel. 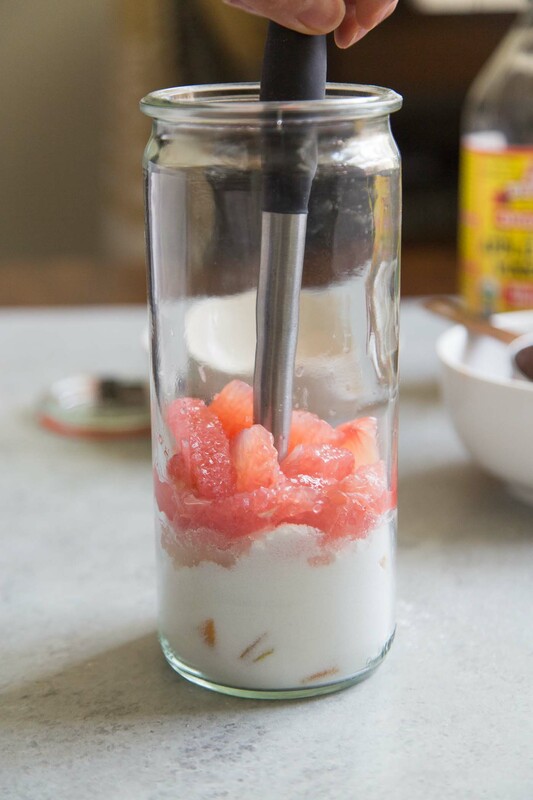 Add grapefruit segments and continue to muddle. Allow mixture to sit for 10 minutes. Stir in vinegar. Cover and let steep in the fridge for 2-4 days, depending on desired flavor profile. Strain out solids. Store syrup in the fridge until ready to use. Add 1 oz grapefruit shrub syrup to a serving glass filled with ice. Top with chilled sparkling water. Stir to combine. Garnish with fresh thyme, if desired. Enjoy immediately. *Note: I prefer to use organic, raw, unfiltered apple cider vinegar "with the mother." The longer the shrub steeps in the fridge, the "mellower" the tart vinegar flavor will be. I prefer mine a bit more tart, so I strain it out between 24-48 hours. love the colors on these!! and they sound so much more palatable than plain apple cider vinegar shots.